Assumption University Alumni Association Building community relationships for robust businesses. continue the Smart Successor program where alumni who are industry experts in their field are invited to give talks to current students. Already we’ve been honored to have two high-profile speakers, first is a financial consulting expert and CEO of IFCG Co., Ltd., and second is the big boss of COM7, a leader in IT products and services. 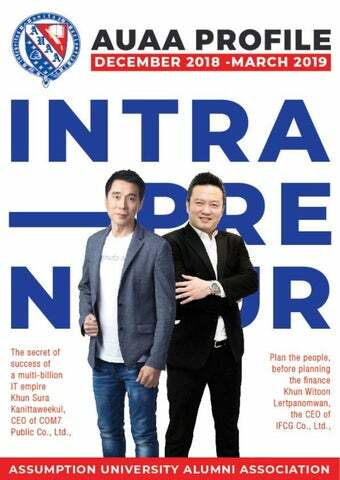 Both shared their experience about intrapreneur-style management and gave us exclusive insight to their successful multi-billion baht businesses. All of this can be viewed now on e-profile, Facebook, and YouTube. For the past 3 years, our alumni committee have shown dedication to our duties by working hard to produce various achievements. AUAA led by Secretary General Khun Phairat Sasiwongpakdee, along with School of Nursing Science, Assumption University, joined SG Alumni Association to give treatment to residents of Saraburi Province. Is Blockchain changing the world? Dr. Pravate would like to reemphasize the importance of blockchain, especially to those who do not work in IT or FinTech (financial technology) industry, because if you don’t understand it may lead to loss of business opportunity. The fun-filled CGA Sports Day promoting and strengthening friendship, unity and reunion among the St. Gabriel’s Alumni featured a variety of exciting games, sports and cheering activities. to graciously preside over the celebration of 36th anniversary of the Ruamchit Normklao Foundation. The most rewarding day of the industrious study lives at Assumption University approximately 3000 graduates. For the past 20 years, COM7 has been leading the retail industry in consumer IT products. Having good financial planning can place a solid foundation for your personal and family life. For the past 3 years, our alumni committee have shown dedication to our duties by working hard to produce various achievements for the Assumption University Alumni Association. It is now time to pass the torch on to the newly elected committee to uphold our association’s vision and to continually improve in future. hint us on the direction of the event to organize. So after the committee election is completed, we plan to organize grand event with Dinner Talks.” This is a good occasion to celebrate, both the university having reached 50 as well as the number of ABAC members reaching 100,000 from 77 countries from around the world. Hence AUAA plans to introduce Alumni Chapter in other countries, starting with those in AEC region. Each country will elect its own president, which will not only help strengthen the connection among alumni, but also to help recruit new international students into Assumption University too. This is killing two birds with one stone. Continuing to build progress We are proud of the success for AUAA of the new website and to see the number of daily visitors Dr. Somprot Sarakosas, who continuing to increase. Because served two term as President of our alumni are spread out in Assumption University Alumni various industries, we plan to Association, gives his reassurance, improve the site by organizing “Over half of the current commit- businesses into categories so tee members have served since the that searching for a business previous term, thus there is no need connection will be easier. to worry about the continuality “I would like to reemphasize of work we have been doing. We’ve to everyone, because we are a continued to assist students and family, please use our venue to alumni, and have introduced build connections in a creative new channels to kindle a strong and responsible manner.” connection for all alumni.” Currently AUAA’s official Celebrating the 50th Anniversary website is https://www.auaa. of Assumption University or.th/ which is linked directly to the university website. We’ve “ This year Assumption designed an online catalog to University celebrates its 50th allow members to search for year and have gained over information, exchange ideas, 100,000 students. This is truly and furthermore to introduce a momentous occasion, and we their business in order to create are waiting for the university to connections among all alumni. Our on-going CEO Forum will receive some improvements; it will be organized at a larger scale and will be more varied. Moreover, the Smart Successor program that was recently launched have received good feedback so our association plans to improve this program to ensure members can receive more benefits. In addition to professional events, we are in the process of organizing sports and recreational events to help strengthen our alumni network. “Before we initiate the events mentioned previously, I want to engage all alumni to become more involved and support AUAA by becoming a sponsor. For our sponsors we have organized an information brochure that list all the activities we are planning this year, and your company’s logo will be posted on our website, Facebook, live on-stage event, recreational event, and all electronic media”, Dr. Somprot explains. วิทยาลัยเป น็ โรงเร ยี นในลำ�ดับท ี ่ 3 ของ Vice President, represented คณะเซ น็ ต์คาเบร ยี ลแห่งประเทศไทย ก่อ AUAA in a meeting with SG Alumni Association at Montfort ตั ้งเม ือ่ ป ี 2475 College in Chiangmai. The Saturday, February 2, 2019 – school, established since 1932, Khun Phairat Sasiwongpakdee, ranks 3rd among institutions Secretary General, and set up by Brothers of Saint Khun Kititat Montrechok, Gabriel. Saturday, February 16, 2019 – Secretary General, Khun Phairat Sasiwongpakdee represented AUAA, along with Adm.Prapruetporn Aksornmat, President of Assumption Association, in commemorating the 135th anniversary of Assumption School. Saturday, March 9, 2019 – AUAA led by Secretary General Khun Phairat Sasiwongpakdee, along with School of Nursing Science, Assumption University, joined SG Alumni Association to give treatment to residents of Saraburi Province. They provided eye checkup and glasses, as well as donated blankets, food, and water – all free of charge. Saturday, March 9, 2019 – AUAA led by Secretary General Khun Phairat Sasiwongpakdee met with Khun Kamol Asavasatitporn, President of ACC Alumni Association, to commermorate the 80th anniversary of ACC School. Tuesday, March 19, 2019 – at 10:00am Dr. Somprot Sarakosas, President, Khun Phairat Sasiwongpakdee, Secretary General, and Khun Kititat Montrechok, Vice President, participated in the annual meeting with SC Alumni Association at the Arnoma Hotel Bangkok to elect Khun Arkom Supangphao to become Union President from 2019-2021. Confederation of Alumni Associations of St. Gabriel’s Foundation (CGA), took place on November 3-4, 2018 at the AU John Paul II Sports Center, Suvarnabhumi Campus. Among honored guests joining the event, was Rev. Bro. Dr. Bancha Saenghiran, AU President-Rector Magnificus, who presented trophies to the jubilant winners. the souvenir gifts and items while the other 53 donors were presented special pins by the Princess in appreciation of their financial contributions to the foundation. The Princess viewed the video presentation highlighting the foundation 36 years’ charitable projects and activities and was impressively entertained by the Thai classical dance as well as the contemporary musical presentation performed by AU students. AU high-ranking administrators, faculty members, staff, students, honored guests and members of the public were happily welcoming the Princess on this special visit. From the last article we learned how Disruptive Technology can add value for various industries around the world. Dr. Pravate would like to reemphasize the importance of blockchain, especially to those who do not work in IT or FinTech (financial technology) industry, because if you don’t understand it may lead to loss of business opportunity. Bitcoin is a cryptocurrency that can be transferred through the internet without the need for a bank; it utilizes pass codes and other methods of security. In its first induction, bitcoin was popular among gamers. The price of bitcoins is determined by the market’s supply and demand during a particular period. Bitcoin transaction fees are lower than credit card rates, or may completely be free of charge. Bitcoin was developed to support peer-to-peer (P2P) network, which means no central entity or government can control or regulate bitcoins. Bitcoin transactions are public, traceable, and stored in blockchain. This allows bitcoins to be traced back to the source and recipient, but doesn’t disclose who owns the bitcoin. Growth of bitcoin Get to know blockchain Blockchain is a series of record of data stored on networks of computers across the net that is not owned by a single entity. Blockchain immutable data cannot be easily falsify because each record of data is stored in Block (ฺBlock) that is linked together by Chain. 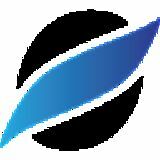 Originally created by a person who goes by the name Satoshi Nakamoto, blockchain serves to bypass the middlemen (ie. banks and agents) who take advantage and profit from user transactions. Users can avoid paying transaction fees and can share information with no central computer, allowing them to lower expense. most importantly in a transparent manner that can be verified by the public. Users can have confidence in the information”, Dr. Pravate explains. Which businesses can benefit the most from blockchain technology? We will discuss further in the next issue of AUAA Profile. For the past 20 years, COM7 has been leading the retail industry in consumer IT products, including computer, tablet, smartphones, and accessories. They are the largest retailer of IT in Thailnad with well-known shops like BaNANA IT, BaNANA Mobile, iStudio, iBeat, and uStore By Comseven. In order to successfully manage such an enormous chain of retail shops, managing the operations from behind the scene and managing the human capital is something Khun Sura Kanittaweekul, CEO of COM7 Public Co., Ltd., prioritizes most in order to hold on to good employees for a long time. Having good financial planning can place a solid foundation for your personal and family life. No one can deny wanting a secure financial future to safeguard against unexpected tragedies which can happen at any time. Khun Witoon Lertpanomwan, an Assumption University alumnus from the faculty of business administration majoring in marketing, is the CEO of IFCG Co., Ltd., a soon-to-be public company, is a key driving figure promoting independent financial advising service in Thailand. Indeed he gained success at a young age It’s the “people” who are the Since financial planning is backbone of a service business a service-based industry, Khun Witoon puts emphasis on the Every customer has a unique “people” involved, which are lifestyle, whether it’s in their 1) customers, 2) partners, and dining, traveling, shopping, 3) employees. If customers can or family habits, every activity achieve their financial goals, boils down to money. My partners can satisfy the customers responsibility is help customers while netting a profit, and understand how to invest their employees can earn a successful money in order to gain wealth living, then this is a Win-Win-Win and reduce debt, and to achieve situation for all. That is why their financial goals. Khun Witoon builds his business around their three stakeholders. Starting a company with only one employee After Khun Witoon earned his MBA from Assumption University, he quit his job and began working in his grandfather’s insurance business. “I have to mention about my experience back in my 1st year at Assumption University. I joined the ABAC Dummy Company in the summer term because I thought it would be a good experience for me. I worked in sales and found that I could use the knowledge I learned in marketing to help increase my sales volume”. Around the time I graduated, the country was faced with the “Tom Yum Kung” crisis that impacted many business in Thailand and all around Asia. Even though his grades were average, Khun Witoon was able to gain real work experience from ABAC Dummy Company which later landed him a job in sales and marketing at a top firm in Singapore. He wanted to gain more knowledge about the insurance trade so he flew to America to join a seminar where top life insurance experts from around the world shared their techniques. “After coming back from America, I saw that Thailand at the time didn’t have any financial consulting business, unlike in America where it’s more established. So I decided to open a company “Termsub Consulting”, even though I was the only employee. My clients grew steadily, but it still wasn’t a sizeable growth because I was looking after every client by myself.” While Khun Witoon single-handedly drove his business, he realized the business could grow substantially if he had partners. So he reached out to several fellow business acquaintances in the financial consulting field and together they form “IFCG Holding Company”. The goal of their independent financial consulting firm is to teach and assist clients reach their financial goal. They offer extensive line of products ranging from stocks, mutual and life insurance funds, property, and tax advising for individual and company. Today the company has seen a strong growth. They employ 250 consultants, 50 staff, and have network with over 1,000 dealers all around various provinces.